Archives : UPA OR NDA.... UP OR DOWN ??? - 15/05/2009. UPA OR NDA …. UP OR DOWN ??? – 15/05/2009. Just as we had mentioned last time, Sensex is encountering a strong resistance in the form of a falling gap which is between 12472-12284 since last week. Sensex has taken a pause this week and traded within the range it created for itself in the previous week. The Sensex is now due or in course to take a direction, which may be up or down, depending on the outcome of the elections. ELECTION OUTCOME HOLDS THE KEY. The market is likely to take direction depending on the outcome of elections. The market will be happy if either Congress led UPA or NDA led by BJP comes to power. The market will falter or breakdown if the third front comes to the centre, because the stability of the government itself will be in question. The most optimistic scenario will be Congress getting above 220 seats and forms the government with the support of its allies. Sensex opened the week at 11997, made a high of 12256, made a low of 11621, and closed at 12173, thus registering a weekly gain of 297 points. Sensex has made a White Opening Marubuzo on the daily charts. Last 3 days are showing a Bullish Morning Star Reversal pattern on the daily charts. On the weekly charts the Sensex has formed a small White Candle which looks like a Hammer but is not a Hammer as there is a slight upper shadow. The long lower shadow is an indication of buying strength at lower levels.The Sensex has left a gap on the daily charts on Friday between11935-11948. This gap will act as a support. The Sensex is moving in the range between 12272 and 11621 which was created last week. The Sensex faces selling pressure as it nears the top end around 12250 levels and buying pressure at 11650 levels. If we consider the weekly support and resistance provided by moving averages then the immediate resistance provided is by the 200 Week M.A. (12777) and strong support will be provided by 50 Week M.A. (11371). The Sensex can give a breakout in either direction on Monday. On the higher side if it breaches 12284 then the Sensex will move further up and fill the upward gap which is between12284-12472. If it breaches the lower range i.e. 11621 then it will fill the lower gap which is between 11621-11430. If the support at 11621 is broken, the Sensex will find immediate support near the previous intermittent bottom (10961) and the 200 DMA (11047). Thus, incase of any fall strong support will be at 11047-10961. If the Sensex manages to breach the upward resistance level (12284) then the Sensex will have a target of 12817. The Trendline Support is at 11803. For the week ahead the Resistance is at 12284-12514-12822. Support is at 11872-11621-11403-11047. Nifty opened the week at 3615, made a high of 3709, low of 3534, and closed at 3671. Thus the weekly gain was 51 points. Nifty has formed a White Marubuzo on the daily charts on Friday. It has formed a Black Hammer on the daily charts on Thursday. It bounced from the strong support zone from 3537. On the weekly charts it has formed a small White Candle almost appearing like a Hammer but with a slight upper shadow. Nifty is moving in a small range since last week i.e. between 3534-3717. As soon as the Nifty goes around 3540 levels buying pressure lifts the Nifty up and the Nifty faces selling pressure around 3710 levels. Nifty can give a breakout in either direction on Monday. If it breaches the lower support of 3534 then it will find strong support at 3351, which are incidentally both the 200 DMA as well as previous intermittent bottom. If it manages to break and close above 3717 then the Nifty will have a target of 3881. If we consider the weekly support and resistance provided by moving averages then the immediate resistance provided is by the 200 Week M.A. (3797) and strong support will be provided by 50 Week M.A. (3448). Nifty O.I.PCR has improved to 1.37 as there is lot of PUT writing seen as a hedge by many traders before the election results are declared. Lot of PUT writing is visible at 3400 strike price which will provide strong support. 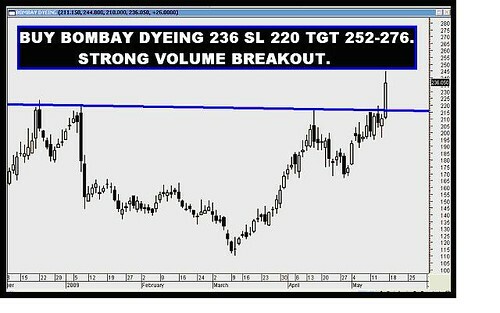 On the higher side, 3800 CALL is witnessing strong CALL writing which suggests strong resistance at higher levels. The Nifty has Trendline Support at 3562-3524. For the week ahead, the Resistance is at 3717-3790-3848. Support is at 3608-3534-3420-3351.